Consists of a nice three bedroom one bath home with approximately 1376 square feet of living area. Home has vinyl siding and some newer vinyl windows. The kitchen has oak cabinets, a dishwasher, cooktop and built-in oven. Nice large living room and some hardwood floors. Main Floor washer and dryer. Gas water heater. Lennox propane gas furnace. Roof on home is only 2 years old composition shingles. Public rural water and septic system. Property offers 5 outbuildings barn, metal building -- shop, 2 car garage, utility sheds Of the buildings, the main metal building is a 40x60 building with concrete floors and electricity. 220A panel. Floor drain. Several overhead doors and a walk in door. Very nice building. Taxes on Land and Improvements of Auction Land will be offered as a multi-parcel auction. Land will be divided as 20 acre, 40 acre and/or 80 Acre parcel increments as buyers choice. Description Land offers timber and pasture with excellent building sites. Of the total 80+/- acres, 53.20+/- are FSA Cropland or open acres. Farm had previously been enrolled in crp and was removed from the program recently. Base acres are to be restored for 2019. Wheat 2.10, Corn 25.50, Soybeans 25.60. Farm has no leases on it. 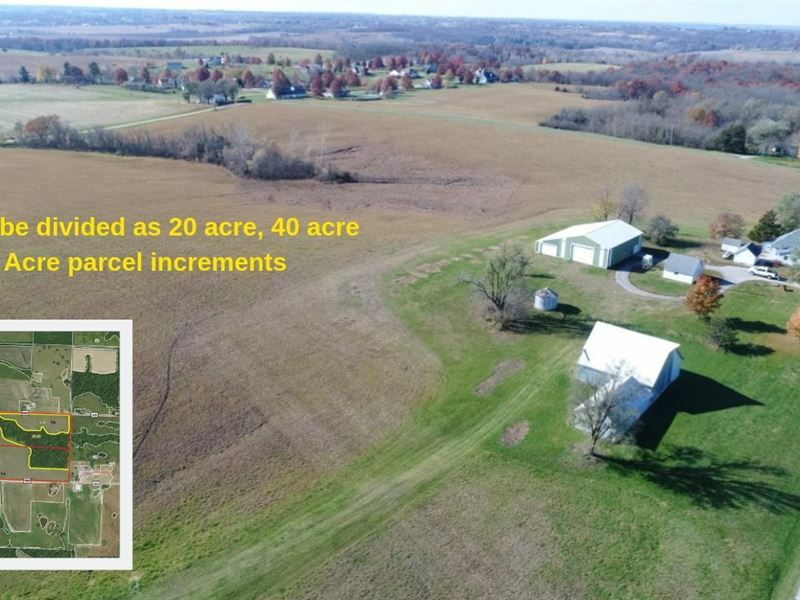 Buyer will have the ability to farm or pasture for 2019 subject to confirmation with the FSA Office. Possession will be given at closing. Access Farm has Route D Road frontage on the West, and Gravel County Roads on the North and South. Buyers should confirm with Andrew County the availability of placing entrances in desired locations. Directions From Savannah MO, East on E Hwy app 3.5 miles to the intersection of D Hwy. Then South on D Highway app 4 Miles to Farm. Farm on East Side of Road. Survey The land will be surveyed prior to auction date. Terms Sellers reserve the right to accept and/or reject any/or all bids. 10 nonrefundable down payment will be due immediately after being declared the winning bidder. Down payment may be made in the form of personal check, business check or cashiers check with the balance due at closing. Anyone not known by the Auction Company or sellers may be required to show proof of bank leter of credit. Closing on or before Jan 16th, 2019. First American Title in St Joseph MO will hold escrow and close the transaction. Winning bidder may take possession of the property at closing. Seller shall provide an Owner's Policy of Title Insurance in the amount of the purchase price and shall execute a proper deed conveying the real estate to the buyer. All informaiton contained in auction brochure and all related items are subject to the terms and conditions outlined in the purchase agreement. Announcements made by the auctioneer at the auction podium during the time of sale will take precedence over any previously printed material or any other oral statements made. The property sells as is where is and no warranty or representation, either expressed or implied concerning the property is made by the seller or Auction Company. United Counry LLC are exclusive agents of the seller. There is no buyers premium on this property. This property is being offered with a reserve. Should the property be divided and new buyer require fence, any and all new fencing will be at the responsibility of the buyer.